Scan surrounding Free & Secured WiFi access points and connect to get instant internet access wherever you are in the world. 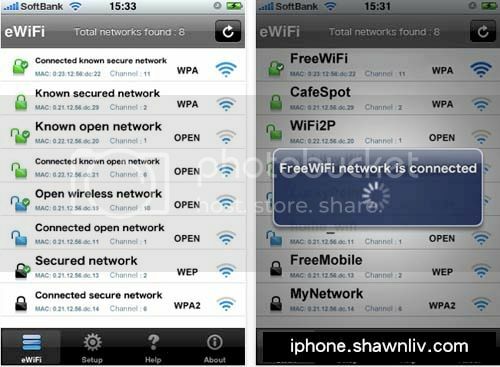 eWiFi is a great utility application for iPhone and iPod touch user who wants to save money using internet through WiFi, for travelers who loves free open WiFi to get internet access during travel. eWiFi also care about expert user who want to connect home and office secure WiFi network automatically with first priority. Auto scan feature of eWiFi finds WiFi access points and connect automatically with suitable network. eWiFi is able to connect with secured network (WEP,WPA) by given password if SSID of the access point not hidden. Another great feature is internet reachability. Every time when eWiFi connects to the wifi then check for the internet reachability and pop-up connection status. So, Check its out Now! A Must Download Free Offline Map When You are Oversea!